Home » Blogs » GreyHawk's blog » Elementary Geometry: The Food Pyramid buried in favor of "MyPlate"
Elementary Geometry: The Food Pyramid buried in favor of "MyPlate"
It consists of four colored sections, for fruits, vegetables, grains and protein, according to several people who have been briefed on the change. Beside the plate is a smaller circle for dairy, suggesting a glass of low-fat milk or perhaps a yogurt cup. Few nutritionists will mourn the passing of the pyramid, which, while instantly recognized by millions of American school kids, parents and consumers, was derided by nutritionists as too confusing and deeply flawed because it did not distinguish clearly between healthy foods like whole grains and fish and less healthy choices like white bread and bacon. The image advises people to eat smaller portions, reduce sodium intake, drink water and low-fat or fat-free milk and increase intake of fruits, vegetables and whole grains. "This is a lot more user-friendly," Hall County Schools Nutrition Coordinator Jennifer Teems said. "It's easy for kids to look at and say, ‘This is what should be on my plate.'" Teems said the only thing she would change on MyPlate was to feature pictures of food. "It is not perfect of course, because it doesn't handle mixed foods, but it is better than the pyramid," Crawley said. "I wish it gave a size for the plate. Most dinner plates are huge now and may result in overeating." Everyone's tastes are different, so the new image may or may not be palatable to some, but most appear to agree that it's a definite improvement over the Food Pyramid...and, in particular, the most recent incarnation of the pyramid, which was called MyPyramid. 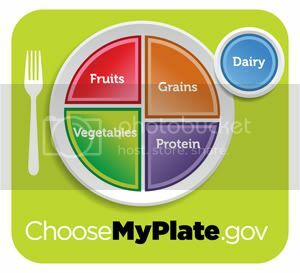 You can go check out the new symbol and nutrition guidelines at ChooseMyPlate.gov. The translation of "My Computer" into "My Plate" is the last mark of the commercialization of American government in my book. The earliest I can remember is when I vomited myplate all over the table when I first realized mygovernment considered me someone'scustomer. We'll see if I still feel this way after cleaning up the keyboard. very healthy, not to mention quite confusing. At least this is a step or two in the right direction: fairly easy to understand, and a little more divested of special interests from the meat and dairy industries.